A few weeks ago, we talked about having a couple of posts on decking. Well, after a detour to deal with heat and algae, we’re back and ready to talk about decks. Just in case you missed it, be sure to check out the article on the suppliers we work with. Join us on this adventure after that. Just like anything else, there are many type of decks to consider. Once you decide on the size and placement of your deck, you have to figure out what kind of deck you want. Brush concrete: A lot of decks have a concrete base, and there are multiple concrete options. 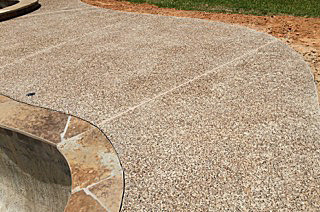 The default option is brushed concrete, which is simply brushing concrete with a specialized broom after it’s poured to create a smooth surface. Brushed concrete is cost-effective. Exposed aggregate: This is next on the price scale. Also known as pea gravel, exposed aggregate is a concrete surface that exposes elements such as granite and rocks for a classy look. 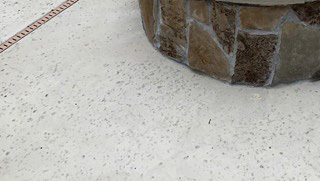 Exposed aggregate is cooler on the feet than brushed concrete. It can be tougher to walk on, but troweling the surface will smooth it out to make it easy on the feet and the eyes. 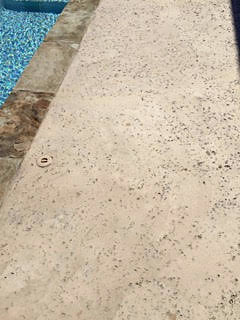 Salt finish: This is brushed concrete with a twist. As the concrete is drying, rock salt is poured onto the concrete and troweled. After the troweling, the surface is washed. The water from that washing dissolves the salt, leaving an earthy surface that’s similar to exposed aggregate. Add color to this finish at extra cost. Spray deck: A spray deck is a way to limit the heat soaking in your deck. 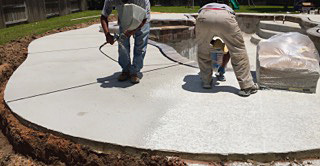 Once you’ve laid your concrete, “spray” it with an acrylic surface. Not only does it add color and prevent heat even when topped with a sealer, it doesn’t whittle or crack with foot traffic. 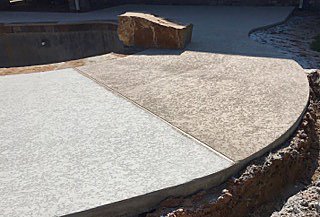 Stained concrete: This is a versatile deck design where concrete is distressed and can be cut into different designs and patterns for an eye-catching look. 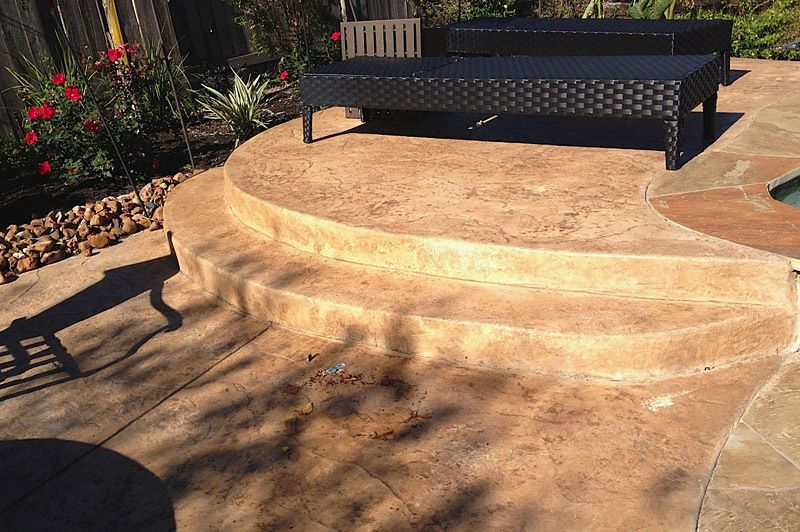 The pieces of a stained concrete deck can be cut into different shapes and stained various colors. Stamped concrete: This is a good option for artsy types. This type of concrete allows for different colors, patterns, and even well-placed cracks in the surface. You can use powder for coloring effects and stencils for designs that will add pizzazz to your deck once it dries. It can mimic flagstone and wood to bring out the artistic nature of your deck even more. Pavers: While concrete is the default deck surface, pavers are also an attractive option. 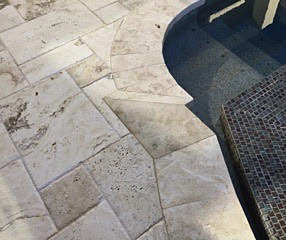 There are two main pavers that we work with — cement pavers and stone pavers, which are also known as travertine. 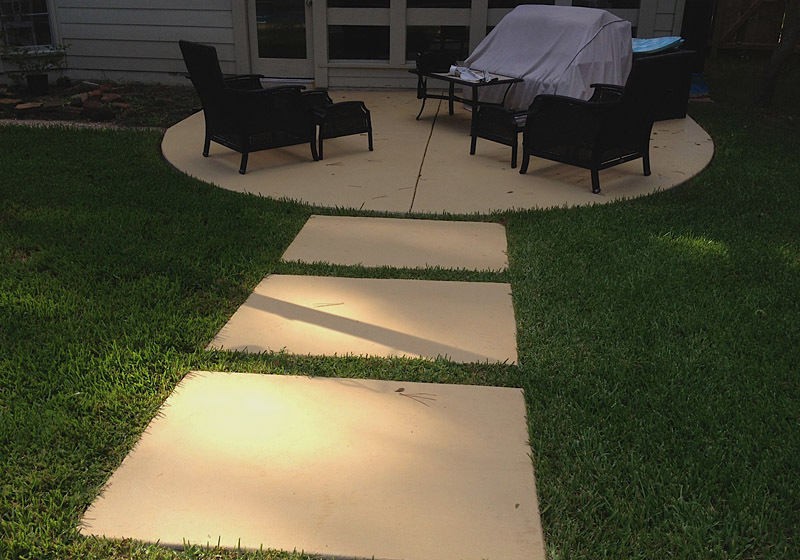 Unlike concrete, pavers are made of interlocking parts that have flexibility. Instead of cracking, pavers have a base that can move, expand and contract as needed. This makes them durable and resistant to the elements. 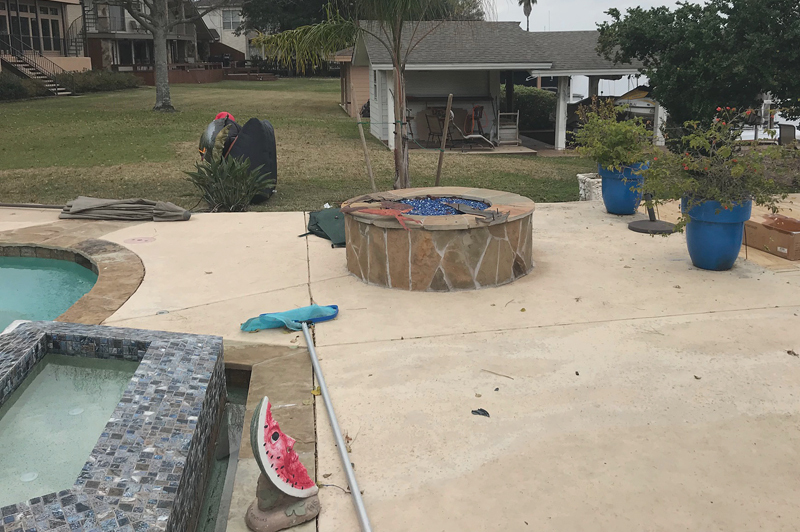 Tile and flagstone: This is another fun option, as you can put ceramic or stone tile on top of the laid concrete for a sturdy attractive look, or add flagstone on top of the concrete surface. There’s a weather barrier applied between the concrete and the tile/stone that serves two purposes. 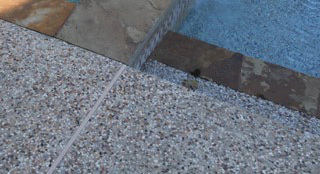 It prevents moisture from seeping up to the surface from the concrete and it prevents the tile from being cracked by tension below the surface. Putting a sealer on your deck provides a protective, colorful layer, making it resistant to the elements. But it’s something that is typically recommended by the deck construction company and is usually restricted to spray decks and stamped concrete decks. Applying a sealer increases the amount of heat the deck exudes, making it hot to walk on when exposed to sun or hot weather. If this is something you can live with, a sealer can be a worthwhile addition. 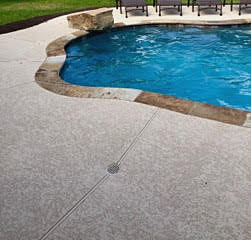 Sealers bring out the life of stones and also enhance the color of the deck. You can also add a sand/silicone dust mixture to limit slippage on the sealed surface in wet conditions. 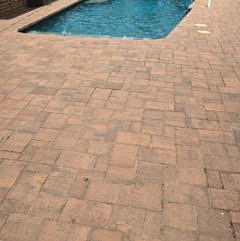 The pool and spa get most of the attention during our installations, but decking really ties your new pool together. While we’ve had plenty of articles about the installation and upkeep of swimming pools and hot tubs (please feel free to peruse the website to enjoy this content), we haven’t had much on decking. But that’s about to change. We’ll jump into the deep end (pun intended) in terms of decking the next couple of weeks. While we’ll get into the nuts and bolts of decking in our next article, in this article you’ll learn about the companies we work with and the products and services that they provide. We hope this article can be a resource in your decking research. 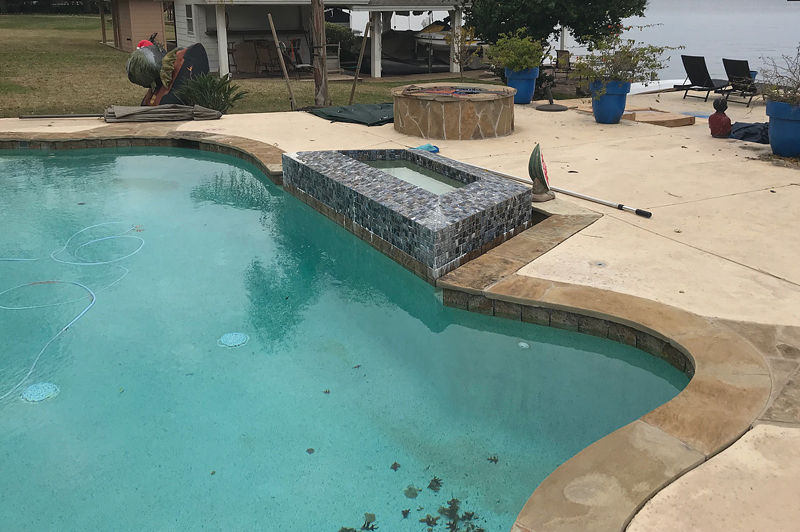 Search the websites of the companies we use to figure out what kind of tile/coping/stone, etc., you’d like surrounding your pool. Stone: We use three companies to provide stone for your deck. They are Model Stone, Champions Stone and A&A Stone. These are our go-tos when it comes to flagstone, but there are plenty of stones to choose from. Oklahoma Wister is a popular style and can be found at these companies. Tile and coping: Before getting into the companies that provide these services, let’s describe what coping is. 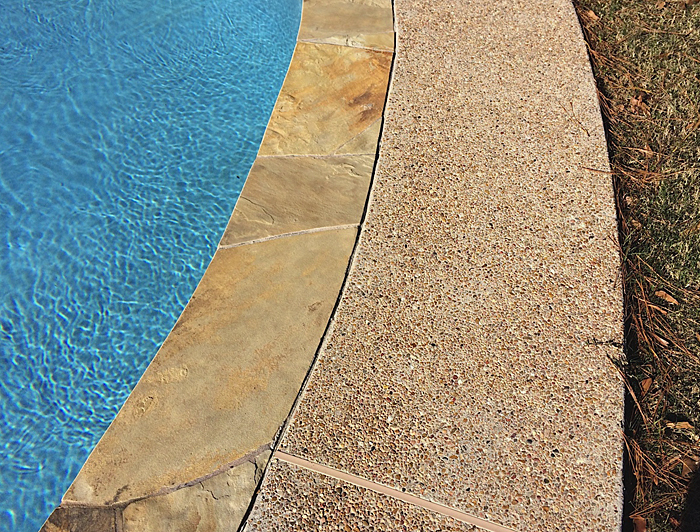 When looking at the picture above, coping is the stone border in between the pool and the rest of the deck. That border also goes over the edge and toward the water, where the coping meets the tile. 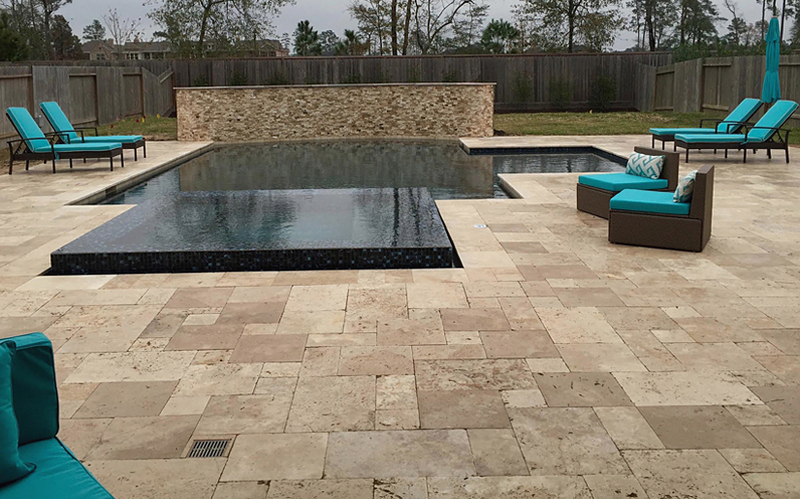 We utilize Master Tile and Noble Tile Houston for these elements. 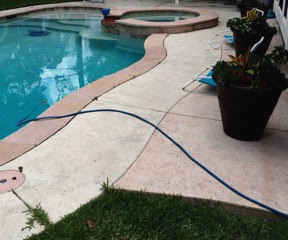 Check out the Pool and Spa Division at Master Tile when looking for the perfect tile and coping. Pavers and decoration: Pavers help durability by serving as a sturdy foundation to your deck. 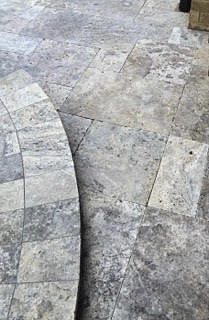 There are two main pavers, cement pavers and stone pavers, which are also known as travertine. Belgard is our source for cement pavers, while Keystone provides stone pavers. As far as colors and decoration, Proline Stamps has accents that will cap off your decking experience. Check out the options on these websites to figure out exactly what you want in your decking. We’ll get it done from there. With March Madness behind us, we are coming upon our spring blitz. 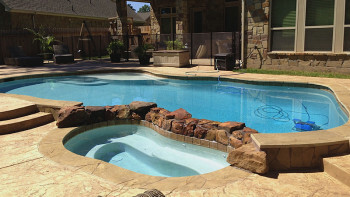 Summer is approaching at a rapid clip, so now is a time when people look into installing a swimming pool. We enjoy this time of year, as it gives us a chance to meet new customers and further branch out into the community. 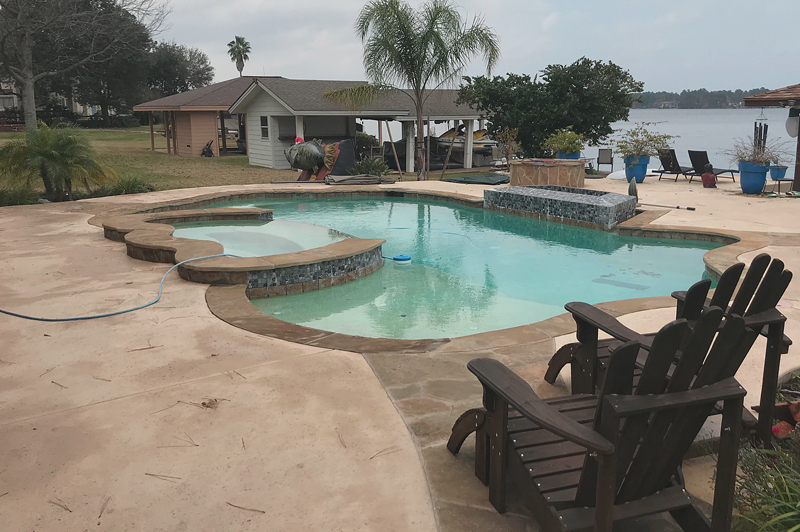 But it’s not necessarily as simple as “I want a pool, what can you do for me?” Well, it can be if you want, but that initial meeting with a pool builder could be a humbling and discouraging one without doing some research first. The last thing we want to do is to discourage and intimidate you from getting that dream pool by quoting a ridiculously large fee that’s way out of your price range. Before deciding which features are important and which bells and whistles you want to have alongside your swimming pool, the first thing you have to do its figure out the exact money you want to spend. 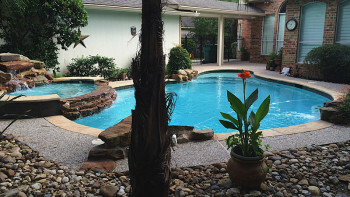 If we know your financial ballpark before we start discussing the size of your pool and all of the options that can be added along with it, we can devise with a realistic game plan that fits your vision of your pool while also being within your budget. A lot of times pool builders will include all of bells and whistles in their initial estimate, which makes for a large, intimidating quote. 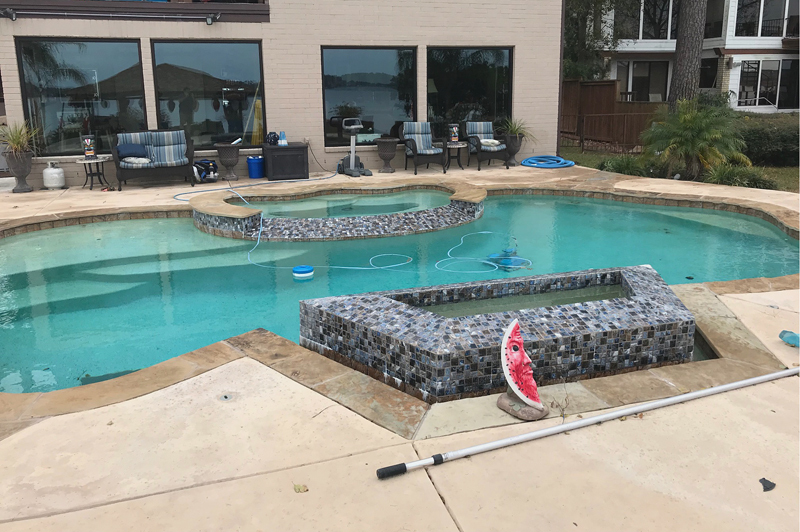 If you figure out your budget beforehand and communicate it to us, we can skip the awkward initial stages and start further along down the path of building your pool. How big do I want my pool to be? How much decking do I want surrounding my pool? 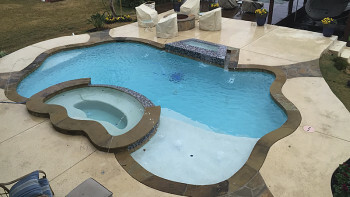 Do I want a hot tub and if I do, where do I want it to be in relation to my pool? Do I want features such as waterfalls, waterslides, lighting or a swim-up bar? Do I want any automated systems such as IntelliTouch, EasyTouch, robotic cleaners or water chemistry tools such as IntelliChem or ozonators? Do I want lighting and if I do, do I want LED or regular lighting? Once you have answered the following questions, then you have to rank each answer in the order of most important to least important. Unless you have an unlimited budget, you might have to choose between a few square feet of decking over a waterfall, at least initially. Either way, it’s important to have a ranking of priorities that you can communicate to your builder to find the perfect combination of features. Once the project has started, your pool size is permanent and your deck size might as well be: You can’t just call an audible and make your pool bigger once the ground has been broken — the size of your pool is set from that point on. Also, adjusting your decking size is a huge pain and can be quite costly. If you decide to add more decking after the deck has been framed out, the colors might not match and the costs will likely rise. Therefore, decide these sizes and costs first before proceeding. This is the point where you have to ask yourself if you’re willing to sacrifice size for more bells and whistles. Decide whether you want a spa and where you want that spa to be: A spa doesn’t necessarily need to be present at the start of construction, but it’s best to tell your builder at that point whether you’ll eventually want one. If you want one down the road and communicate that to us, we can install the necessary piping and drainage at initial construction for a much lower cost than it would be down the road. However, once you decide you want a spa, you need to come up with a set placement for it. You can’t pick up and move the spa, and the overall cost of the spa is directly related to its distance from the pool equipment pad. 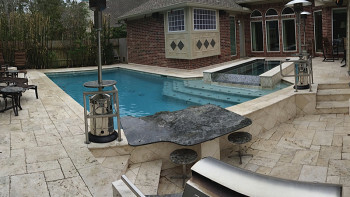 Features can come later, but it’s best to decide now if you’ll eventually want them: Items such as waterfalls, plaster, slides, swim-up bars, and fire pits are things that can be added down the road and can be treated as line-item additions, but it’s best to plan for their addition during the initial construction. If you decide at the beginning that you’ll want a waterfall down the road, we can install a main drain now and wouldn’t need to drain or replaster the pool in the future to install the waterfall. Having to drain and replaster the pool in the future would cost considerably more money, so if you think you might want a waterfall down the road let us know now. Your bank account will thank you. You can add smart systems at any time: Items such as the IntelliTouch, EasyTouch, ScreenLogic, ozonators or robotic cleaners can be installed at any point along the way. 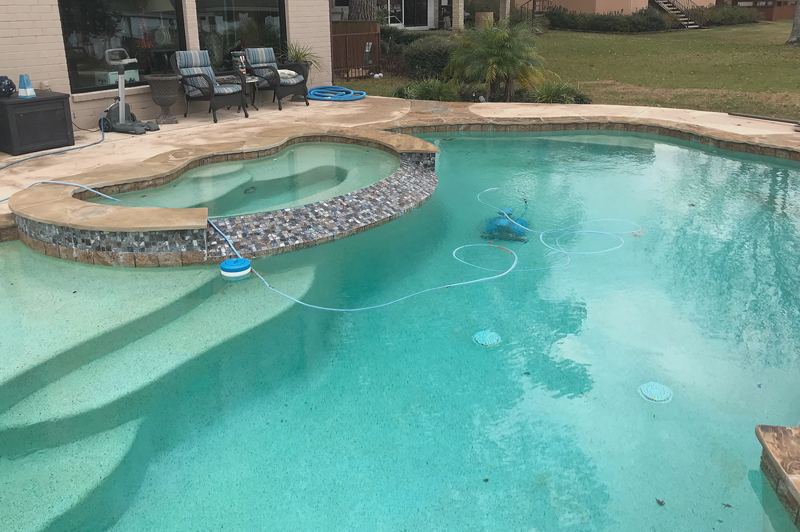 We add these systems to pools that were built years ago, so if you decide you want to control your pool functions and water chemistry through your computer or smartphone down the road, we can help. Lighting can be installed at any time, but once you decide on the type of lighting, that’s permanent: We can install regular lights or LED lights whenever you’d like, but if you get regular lights initially, we can’t retrofit existing lighting niches to LED down the road and vice versa. The technology for that change simply isn’t available yet. It’ll come, perhaps soon, but for now, whatever lights you choose are the lights you’re staying with. 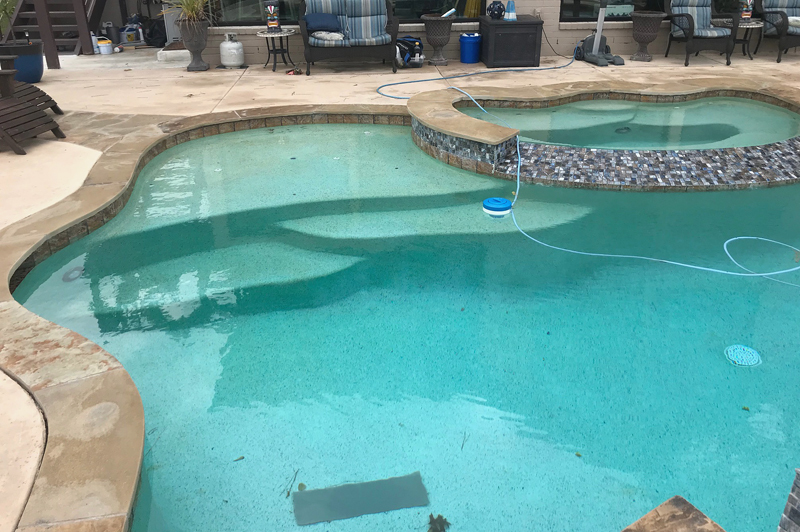 This is fifth and final part of our series on rain and moisture and how it affects the pool-building and maintenance process of Ultimate Pools. To access the first four parts, click here. One caution. Even with best intentions decks can move, crack, etc. as our planet is constantly moving. But we do our best! So what are some of the risks of building a deck or laying stone on soaked ground? Insecure foundation for decks: The first part of building a deck is constructing a sturdy concrete foundation that will keep the deck secure for years to come. To do that, you have to frame the foundation of the deck, pour concrete down underneath it, and let it dry before you start the construction of the actual deck. However, if you do this on wet, saturated ground, you run the risk of the foundational concrete becoming misshapen or slipping during the drying process, compromising its integrity and exposing it to cracks down the road. Overly saturated ground can also cause the concrete itself to take on water, making it weaker and subject to cracking and eroding down the road. 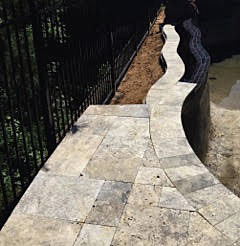 Uprooted stone: When we place stone in your yard — whether for the surface surrounding your pool or to create a walking path from your pool to your house — we want to make sure that the first time is the only time we have to set it. If you think we’re repeating ourselves, you’re right, because we really do strive to do it right and do it well the first time, even if it takes a little more time than initially planned. As for laying stone, wet, saturated ground encourages slippage, as it is a lot harder for the stone to adhere to the surface when that surface is soaked. This can cause problems down the road, from stone slipping out of position to popping up from the surface. Insecure stone can be dangerous, so we’ll wait until the environment is right to keep it in place. 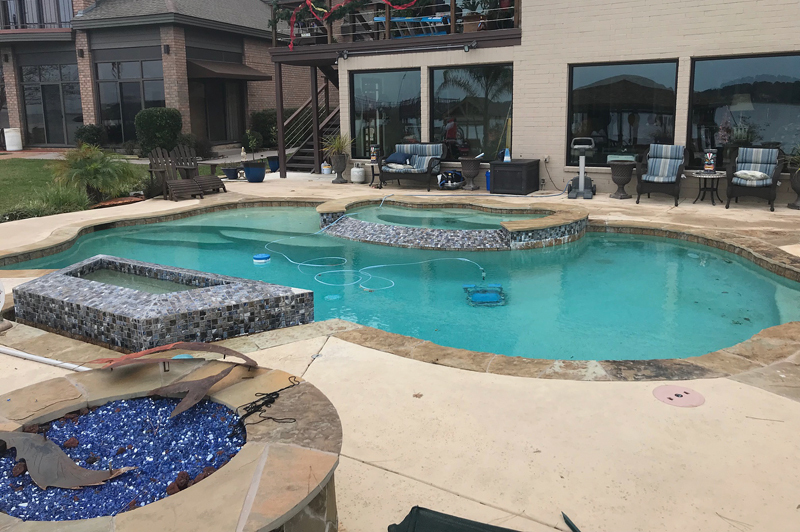 We know that you want your new pool, deck and stone to be done as soon as possible so you can enjoy all the perks that they have to offer. But when the weather outside is frightful, it might take a bit longer than usual. We’re confident you’ll enjoy the end result, though.